At first wash mutton and cut it to cubes then keep it aside. Next wash basmati rice 2 times and soak in water for 15 minutes. Take a mixer grinder in that add all the items for grinding and grind in to a smooth paste. 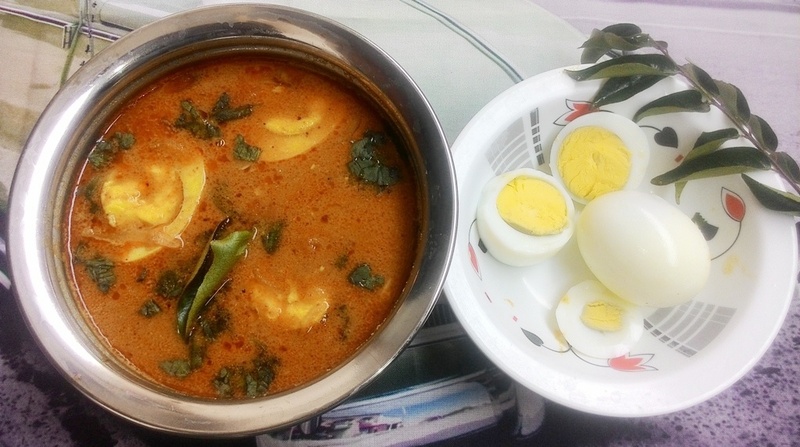 Now switch on the stove place a pressure cooker add oil and ghee when it is heated, add all raw spices one by one bay leaf, cardamom, star anise, Marathi moggu, cashew and fry till it become golden yellow colour. It is time to add sliced onion fry for a minute, add green chilli and ginger garlic paste fry till raw smell disappear, then add chopped tomato fry till it become mushy. Next add all spices powder turmeric powder, red chilli powder, Kashmir chilli powder, Biryani masala and then required salt. Its time to add grinded masala. fry till oil release from sides in low flame. After that add 1 ½ cup water and allow it cook in high flame. After 20 minutes, check mutton pieces whether it is cooked or not. If it is done means add 4 cups water and allow it to boil then add washed rice then wait for 10 minutes. Next add lemon juice and curd in mutton biryani recipe and mix well. Finally check spicy and salt for the mutton biryani and close lid, then cook up to only one whistle. Now slow the flame and allow for Dum in 10 minutes. Switch off the stove and allow it to cool down naturally, after pressure released from cooker open it and mix gradually. 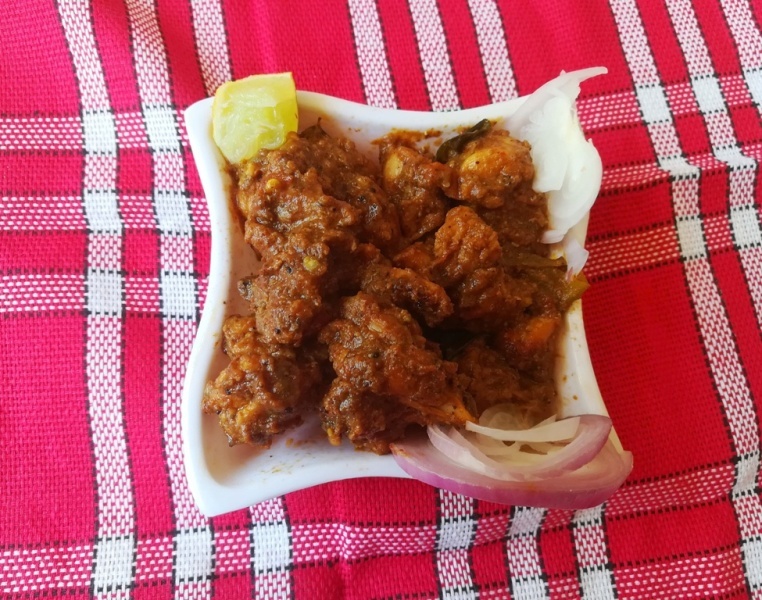 Transfer South Indian Style Mutton biryani recipe in to serving plate and serve with onion raita and spicy mutton kuzhambu. 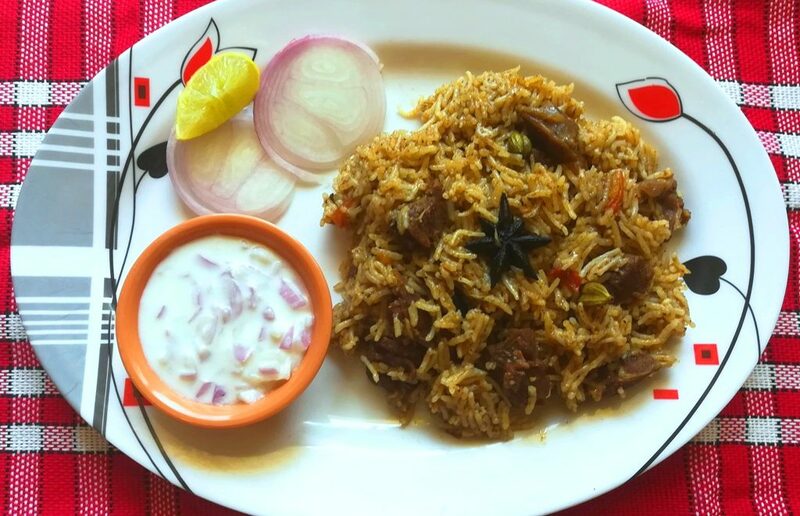 Now hot and spicy easy mutton biryani recipe / Lamb Biryani recipe is ready. Here i used basmati rice, you can use seeraga samba rice also, and the taste will be differing. If mutton is not cooked in 1 and ½ cup water, add another cup water. (adjust the spicy level by adding biryani masala).